As a dynamic and fast-moving company, DCSL Software is meeting the exciting challenges of developing first-class bespoke software in a diverse marketplace head on. As a leading bespoke software development company with a growing number of clients our achievements now include Microsoft Gold Application Development status, Quality Assurance Certifications and Software Testing Partnerships as well as winning prestigious business awards. 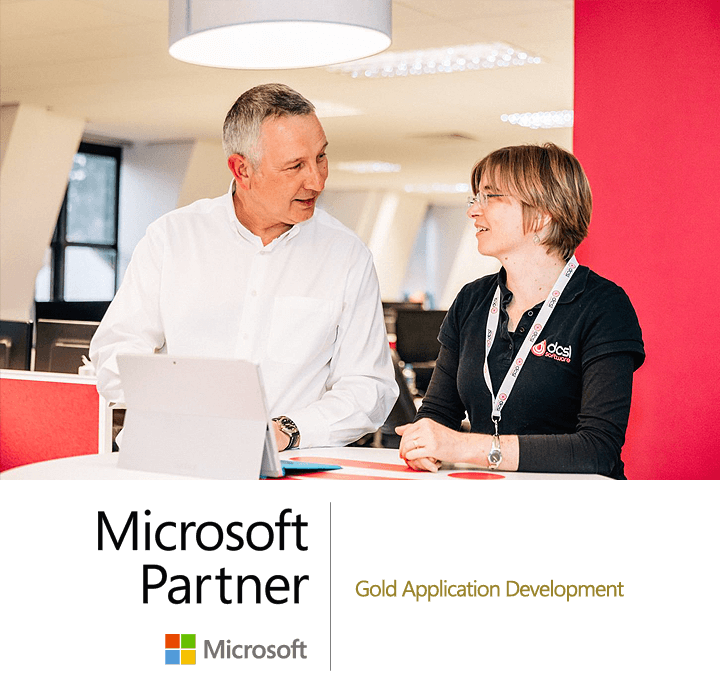 For our customers, becoming a Microsoft Gold Application Development Partner means we build software of the highest possible standard according to Microsoft’s widely-recognised partnership programme. As a bespoke software development company this is not an insignificant achievement and it supports our commitment to excellence and to all our customers. Achieved through a combination of things, including our software development team attaining several MCSD qualifications, DCSL providing a high level of customer satisfaction through regular customer surveys and from satisfied customers writing testimonials. We currently have the “Application Development” competency which means we are focused on, and are experts in, developing software using Microsoft’s technologies, and we have met exacting criteria assessed independently by Microsoft. We agreed to collaborate with Microsoft to establish a close working relationship with them and we won the genuine stamp of quality and expertise in Microsoft technologies. ISTQB has created the world’s most successful scheme for certifying software testers and DCSL Software has been recognised by the UK Testing Board (UKTB) as the first UK Silver ISTQB (International Software Testing Qualification Board) Partner. “Partnering with ISTQB and UK Testing will give DCSL Software a unique opportunity to show to our clients we are committed to building and training an industry-recognised QA team”, said Peter Boakes, QA Manager from DCSL Software. Crown Commercial Service (CCS) helps public sector organisations save money by providing a route to high quality products and services. After a competitive tender process, DCSL Software has been accredited as an official Crown Commercial Service supplier to deliver digital services to HM Government across two frameworks: G-Cloud and Digital Outcomes and Specialists. 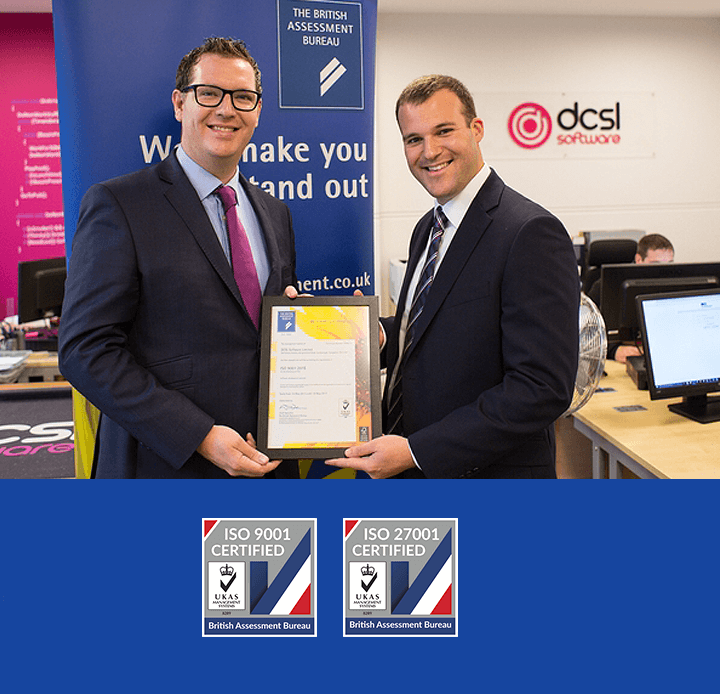 The world’s best recognised quality standard – ISO 9001 – was revised in September 2015 to ensure it remains recognised as global best practice for organisations looking to implement a Quality Management System and we were one of the first companies in the world to achieve the ISO 9001:2015 standard. As a leading provider of bespoke software solutions, backed by Microsoft approval, DCSL prides itself on delivering the best possible service. To demonstrate this commitment, we sought the independent certification to this standard. To demonstrate our commitment even further, DCSL Software volunteered to take part in the ‘Early Adopter’ accreditation process with our certifier – the British Assessment Bureau – in order to become one of the first companies to make the transition to the new ISO 9001:2015 standard. The British Assessment Bureau was one of only eight Certification bodies in the UK to be part of the Early Adopter process, with DCSL Software being one of the audits witnessed by the UK’s National Accreditation Body – UKAS. DCSL Software has also achieved ISO27001:2013 certification, which for the customer means our key focus is on continuous management of the security of company information, as per the Information Security Management System (ISMS). Cyber Essentials helps prevent the vast majority of cyber attacks. Even a simple virus or piece of malware could result in loss of company and client data, disrupt your cashflow and take up staff time. DCSL Software protects the customers against common cyber threats with Cyber Essentials Plus. Cyber Essentials Plus tests of the systems are carried out by an external certifying body, using a range of tools and techniques. We were delighted that DCSL Software won the UK IT Industry Awards 2018 “Organisational Excellence” award. The UK IT Industry Awards remunerates the contribution of individuals, projects, organisations and technologies that have excelled in the use, development and deployment of IT in the past 12 months. We are delighted that DCSL Software has won the prestigious award for ‘Business of the Year’. The Inspire Business Awards celebrate the success of local businesses in north Hampshire and ensure leading local businesses gain the recognition they deserve in the marketplace. We are voted the #1 Software Development company in the United Kingdom, 2018 by Clutch. Clutch was created to help buyers of professional services find the best companies to meet their very specific needs whilst identifying leading software firms that deliver results for their clients for you. We have been voted by them as being in the top 3 Software Companies in the UK, which is a great honour and testament to our successful work. We’ve been recognised as a company with a strong reputation in the marketplace, achieved through positive reviews, ratings and client testimonials. We are delighted that DCSL Software is a finalist at the prestigious National Business Awards. This award celebrates organisations that help businesses to increase profitability by improving efficiency, developing talent and implementing innovation, recognising the impact of ‘enablers’ that offer value beyond support products and services. We are proud that Nick Thompson has won the INSPIRE 2016 Entrepreneur of the Year Award. The Inspire Business Awards celebrate the success of local businesses in North Hampshire and ensure leading local businesses gain the recognition they deserve in the marketplace. DCSL won the Business of the Year award category, which took place in our local community. This award recognises a company leading the way in business excellence. Nick won the Entrepreneur of the Year award category at the same ceremony. This award recognises a person who has demonstrated great ability in starting, growing and sustaining a successful business. We have been voted by them as being in the top 5 Software Companies in the UK, which is a great honour and testament to our successful work. DCSL’s very own Nick Thompson was recognised as an employer/leader who has demonstrated exceptional leadership qualities and was included as a finalist in the Leadership award. We were delighted that Nick Thompson was one of three finalists for the Entrepreneur of the Year category. The Inspire Business Awards celebrate the success of local businesses in north Hampshire and ensure leading local businesses gain the recognition they deserve in the marketplace.